Previously I talked about your typical NIMBY’s. Today I am going to discuss a different type of NIMBY called the community activist. While they both end up being NIMBY’s the motivation behind the community activist makes them a different creature all together. First of all there are two different types of community activist. The first one is to be despised. They are either out to make a name for themselves or just get their name in print. They could care less what ultimately happens so long as they benefit from it. The second type of community activist is the one I will really focus on. For the most part they truly car about what they are trying to accomplish but often end up being obstructionist much like regular NIMBY’s. I am going to pick on the west side for this example. First of all let’s look at how the west side ended up in its present position. The first big blow to the west side came when it was cut off from the west of Salt Lake City by Interstate 15. In fact it is hemmed in on three sides by freeways and despite what the road warriors will tell you, when a community is cut into pieces by a freeway it causes it to loose a part of itself. It doesn’t matter if it’s above or below ground; the freeway divides an area into separate parts. As you know over time the Westside was largely ignored and forgotten while most of the money went to the east side of town. The problem with activist from this scenario is that they feel that they deserve everything handed to them but see everything as a threat to their neighborhood. They get so caught up in their own little world that they are not willing to accept anything that will for the common good. The TRAX line along 600 West is the perfect example. This would have service the greater good as it would allowed a direct connection from Central Station to the Airport. UTA could still route the trains into the station but they would either have to travel through downtown first and head back or miss downtown entirely. Only a small number of homes would have been affected by the line and they are already cut off from everything in sight anyway. On the other hand the community activist thinks they should be handed everything. They complain that they are not seeing enough economic development yet they do little to help their community attract businesses and promote the locally owned businesses that are already in their community. The first thing community activist must do is stop having the victimization complex. While the west side has gotten the shaft in the past, the only way to change things is to work with the rest of the city not against them. Second they need to deal with the problems they have in their community especially the gang problem. They need to show that they have the community organized to make it a better place before businesses are going consider moving to the area. They also need to work with existing businesses to promote the area and bring new attention to the area. Turn their disadvantage into an advantage because they are different from the east side. Too many community activists are nothing but obstructionist and in the long run they cause more harm than they do good. However, they need to work with their community to make it a place that people want to come to instead of a place people want to avoid. Here is another Perils for Pedestrian Video. As a follow up to yesterday’s media advisory on the beginning of FrontRunner commuter rail service to Pleasant View, Utah, please note that the departure time from Pleasant View for the morning commute has changed. Morning: FrontRunner will depart Pleasant View at 6:33 a.m. M-F arriving at Salt Lake Central Station at approximately 7:52 a.m.
Evening: FrontRunner will depart Salt Lake Central Station at 5:10 p.m. M-F arriving in Pleasant View at approximately 6:23 p.m.
Construction progress continues on the West Valley TRAX Line. To keep business and traffic impacts to a minimum, this five-mile project has been separated into seven construction “reaches,” or segments for management and planning purposes. The map below shows each construction reach in a different color, starting with Reach 1 in light green on the south end of the project and ending with Reach 7 in dark green on the north end. Reach Description: Reach 1 is the area along Constitution Boulevard (2700 South) from West Valley City Hall at 3600 South, extending north to 3100 South. This area includes both large and small businesses, as well as many residents. Access to all businesses and residences will be maintained throughout construction. Upcoming Construction: Third party utility relocations will continue to take place in this reach throughout the next couple of months. Current Construction: Some utility work is taking place along the south side of 3100 South just east of Constitution Boulevard. Work is also taking place along the north side of 3100 South just west of Decker Lake Drive and along the north side of The E Center. Construction is anticipated to intensify on the south side of 3100 South just east of Constitution Boulevard by the end of October or first part of November 2008. Work in this area will continue to take place along the sides of the road for the next several months. Reach Description: Reach 3 is the area along Decker Lake Drive from 3100 South to 2770 South and on 2770 South running east to Redwood Road. This area includes many commercial office buildings with thousands of employees who access this area on a daily basis. We will continually work with these businesses to ensure access is provided at all times. Crews have also started to expose utilities along Research Way located at 2770 South just west of Redwood Road. Access is being maintained and impacts along Research Way should be minimal at this time. Upcoming Construction: Construction is anticipated to take place along Decker Lake Drive throughout the next several months. Currently, traffic has switched to the west side of Decker Lake Drive, one lane of traffic is operational in each direction and access to businesses is maintained. Current Construction: The majority of construction taking place on the West Valley Line is currently taking place in this area. Construction in this reach is on the east side of Redwood Road as crews continue to clear the way for TRAX on the north side of the Brighton and Decker Lake Canals and the Jordan River. Currently, crews have created a corridor for TRAX that extends into Reach 5 and connects to the industrial area along 1070 West and are working with residents in this area to coordinate activities taking place along their backyards. Crews have reinforced a box culvert that runs along the Crosstowne Trail and have backfilled the area with dirt. Significant work is also being accomplished on the foundations for the overhead wiring system that is necessary for TRAX to operate and on an underground duct bank as well. Upcoming Construction: Crews will continue installing the foundations that hold the overhead wiring system for TRAX and will work with residents along the Jordan River to coordinate construction activities. A permanent fence will be installed just east of the Brighton Canal to the Khadeeja Islamic Center on Parkway Avenue. Sound walls for the area located on either side of the Crosstowne Trail between Redwood Road and just west of the canal will be installed over the next couple of months as final design becomes available. · The Crosstowne Trail along 2770 South just east of Redwood Road to the Brighton Canal is currently closed. Once TRAX construction is completed, the trail will be operational in this area. Current Construction: Crews have started preliminary construction in this reach along 1070 West. They are currently “potholing” or exposing utilities in this area to determine their exact locations under the street. Upcoming Construction: Construction is anticipated to begin the first couple of weeks of October along 1070 West in Chesterfield. Traffic lanes and access to businesses will be maintained throughout this work. Traffic Impacts: Currently, any impacts to motorists should be minimal in this construction reach. Current Construction: Construction crews continue to install utilities in this reach. Upcoming Construction: Coordination will continue with the Union Pacific Railroad to install utilities in this reach. Reach Description: Reach 7 is the area where the West Valley Line will connect with the current North/South TRAX Line. Construction in this reach will take place along Andy Avenue in South Salt Lake. Crews will closely coordinate activities with businesses in this reach to ensure access is maintained at all times. Current Construction: Crews have removed the old track along Andy Avenue and are installing a water line in this area. We will continue to update businesses along 600 West regarding construction in this area. Upcoming Construction: The water line installation at Andy Avenue will continue throughout the next several weeks as construction continues east toward 300 West. Traffic Impacts: Impacts to motorists should be minimal at this time. If you have questions not answered by this report or any comments regarding the project, please contact our toll-free 24-hour hotline at (888) 800-8854 or e-mail thope@rideuta.com. You can also visit UTA’s Web site at www.rideuta.com. Two organizations in the Tri-State area of New Jersey, Lower New York and Connecticut are working together to provide grants for transit oriented development. While some road warriors will use this as ammunition against transit projects, as not in this blog and others there is plenty of subsidies going to big box retails and developers. Orange County's Ultra-Right Wing newspaper has come out against the proposed high speed rail bill that is on the November ballot. No surprise there but there is some good comments about public/private ownership. For those not familiar with the situation, San Francisco is the first and so far only place in the nation to actually tear down a freeway after it was damaged in the 1989 earthquake. 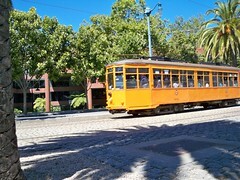 Instead of a elevated two story freeway along the water front you have a nice pedestrian friendly boulevard with the F line historic streetcars traveling north of Market Street and the quasi Light Rail/Streetcar lines traveling south. Who will be the next to get rid of a freeway? A bill that will give Amtrak $13 Billion over the next five years about also include privatization and safety improvements has passed the house. Los Angeles may be moving to offering a bike sharing program. I have mentioned in the past that one of the biggest problems transit agencies face is that they are usually totally dependent on the sales tax which is very cliclical. The RT Rider in Sacramento hsa some alternative ideas to the sales tax that may be worth exploring since something like a property tax is dead before it gets started. What would happen if they actually turned UTA over to UDOT? Would we be dealing with the same kind of stupidity that California is now facing? It just proves the stupidity of that idea but we must remember it is promoted by the people pulling the puppet strings who want UTA's money to highways. Talk about making a street in Baltimore better. Founded over three decades ago in 1976, URPA is a nationally known policy institute that focuses on solutions and plans for passenger rail systems in North America. Headquartered in Jacksonville, Florida, URPA has professional associates in Minnesota, California, Arizona, New Mexico, the District of Columbia, Texas, and New York. For more detailed information, along with a variety of position papers and other documents, visit the URPA web site at http://www.unitedrail.org. 1) ONBOARD AMTRAK TRAIN NUMBER 97, THE SILVER METEOR, Southbound, between Jacksonville and Fort Lauderdale, Florida, Thursday, September 25, 2008 – The Silver Meteor is running about a half hour late south of Orlando, but that’s okay. Just before noon, we came to a sudden stop somewhere 20 minutes past the middle of nowhere in the fern growing area of Volusia County (west of Daytona Beach for those unfamiliar with Florida geography). Our locomotive engineer had spotted a stalled truck at a roadway grade crossing, and was able to bring the Meteor to a stop before slamming into the truck. After waiting 25 minutes for a tow truck to arrive and clear the tracks, we were on our way without harm or injury to anyone. It’s a good day for the train and engine crew; an often unavoidable accident scenario failed to materialize. Load factor leaving Jacksonville in the three sleeping cars, dining car, lounge car and three of the four coaches which are occupied is hovering around 50%; not bad for an early fall trip after school is back in session. Downline business is brisk for the Florida part of this journey. More passengers board in Jacksonville than detrain, and every station stop brings new passengers boarding, including sleeping car passengers. This onboard services crew of three sleeping car attendants, one dining car chef, one dining car lead service attendant and one dining car waiter, plus two lounge car attendants and one coach attendant (for four coaches) is on the last nine hours of its weekly run between the Miami crew base and New York City, and return. 2) The crew, like the passenger cars, are beginning to show some weariness. Everyone is friendly and has a smile on their face, but as we race closer and closer to Miami, the anxiousness to be home shows. The coach attendant gave up on keeping the coaches anywhere neat and tidy. Some restrooms are nearly inhabitable, others are completely non-habitable. Tony, the young man who is one of the lounge car attendants, has his necktie flying at half-mast, and it’s tough to determine if he’s fashionably sporting a two day growth of beard, or if he just didn’t bother to shave before coming on duty this morning. He’s chugging an energy drink to keep his obviously heavy eyelids open, and, when he’s seated at a table for the moment while no passengers are at his counter, he’s busying himself with games on his cell phone. The other gentleman lounge car attendant doesn’t bother to wear a necktie or uniform vest or name tag. The sleeping car attendant in the first sleeper is napping. Jay, the attendant in this car, however, keeps his car in good order, and is frequently checking with his passengers to see how he may serve them. Safety doesn’t seem to be much of an issue with many on this train and engine crew; car doors have been propped open (many don’t fully work), and there is a propped open door between the forward sleeping car and the baggage car, which has both of its doors open at each end, exposing the trailing locomotive without any foothold between the baggage car and the locomotive. An over-enthusiastic, enquiring rail fan could easily bring harm to themselves on this train. One thing is certain. When Amtrak still had onboard service chiefs, silliness like this didn’t exist if the chief was on the ball. This is a crew with no supervision, and it shows. This also brings up the question: since the demise of the Pullman Company less than five years before the advent of Amtrak, why has the crew quality declined so much? Why do all other areas of the travel and hospitality industry, from air lines to cruise lines to hotels demand and receive so much more from their employees than Amtrak ever has since it formed in 1971? Why is it okay for railroad onboard employees to have sloppy appearances, for ticket agents to often look unkempt? Doesn’t anyone understand the appearance of employees directly impacts performance and customer/passenger acceptance? 3) Breakfast was available in the dining car after leaving Jacksonville this morning, and, while the selection was slim, the food was served hot and had a good presentation, even if it was served using disposable plates and cups. Lunch was a nice variety, ranging from burgers (turkey or beef) to meatballs over yellow rice to a chicken salad sandwich. As always, a vegetarian lunch was available, too. Dessert was a special treat, a chocolate and cherry torte, good enough to be found in any restaurant. Today’s beef cheeseburger, a warmed up pre-cooked concoction, could best be described as, well, close to unacceptable. Whatever cow gave it’s life for that cheeseburger, gave its life in vain. 4) The state of the passenger car rolling stock on this train which used to be the flagship train of the Seaboard Air Line Railroad (the Silver Meteor was the first streamlined train from New York to Florida, dating back to the 1930s), is less than stellar. Most of the problem stems from poor maintenance. It is a sad irony this equipment is principally maintained in Miami at the Hialeah shops. Before controlled by Amtrak, the Hialeah shops were rated as one of the two best in the country, the second being King Street in Seattle. A comparison of this equipment to the real world would be that of an aging Holiday Inn about to lose its franchise because of a lack of maintenance. Rusty metal in the Viewliner sleeping cars, chipped paint, doors that don’t work ... you name it. The large surface areas are mostly clean, but the "details" usually found in the best housekeeping are missing. Anybody’s fussy mother would look at this level of lack of cleanliness and only snort in derision at so much dirt and filth left behind by the cleaning crews. These sleeping cars are only a dozen years old, but they’ve been run hard and never put away for any type of extensive maintenance. Fifty of these cars remain in active service, with a daily use requirement of 39 cars. Twenty-two percent, with a replacement value of over $1 million per car of this Viewliner sleeping car fleet is always out of service. The exciting video and audio systems which equipped these cars when new are long gone. Door handles and locks have been replaced with hardware store fixtures. Window shades have been replaced with curtains because the shades no long go up and down. The seats, which convert into beds remain comfortable. The annoying chair in the full bedrooms which was welded in place and prevented the lavatory door from opening fully has been replaced by a clever folding chair which allows for extra seating while permitting the door to open fully. The dining car, of Korean War era heritage and a survivor of Henry Christie’s "A" and "B" list for equipment to convert to head end power, has been recently refurbished, and is neat and clean, but has a lunch counter feel to it. The carpets are replaced by linoleum, and spray paint has been liberally applied to every surface, whether or not it was originally intended to be painted. The three decades old lounge car and coaches have all recently been refurbished, too, but hard wear has taken a toll. Missing molding, carpet replaced by linoleum in the lounge, and various signs of hard use are everywhere. This lounge car is one which has been converted for either lounge or lounge/dinette use. There is the usual assortment of lounge rats hanging out, plus some families and assorted passengers using computers, taking advantage of an electrical outlet at every table. There are no longer any crew cars on single-level long distance trains, so revenue sleeping car space must be taken out of service to house crew members. From a distance, the outside of the train looks good; up close, there are missing decals, cracked and peeling paint, and a general lack of upkeep. 5) Stations along the route in Florida which were originally built by the Seaboard Air Line Railroad and the Atlantic Coast Line Railroad have mostly seen better days. While the relatively new (built in the 1970s by Amtrak) station in Jacksonville has seen some much needed improvements, many of the other stations have that look of benign neglect, and hope for a better budget year next year. 6) By federal statute, Amtrak has the right of way over all freight trains, and on this day, CSX has given us the railroad. We’ve had one stop other than for the stalled truck in Volusia County, and the quality of the ride has been superb. Once bumpy track has been replaced with smooth-as-glass continuous welded rail, and we know why the this railroad used to be referred to as the Seaboard Air Line. Rail fans and Amtrak apologists will protest this account; after all, the train arrived on time, departed on time, and arrived at my destination station on time. The trip was overall uneventful, and everyone smiled. Anyone who understands the business of travel and hospitality is appalled. Whether or not Amtrak receives mountains of free federal monies every year, it is still a business, but it operates like a poorly-run government agency, with no accountability. If Amtrak is going to succeed, it needs to shed its ambivalence towards most things proper, and start behaving like it has constant adult supervision. 7) This is the long distance network of Alex Kummant’s Amtrak, the one so many people are now clamoring to bring new train service to their cities and states. If you were considering one particular phrase to describe today’s Amtrak, you could probably do it with just one word – mediocre. Sleeping car passengers are paying multiple hundreds – and sometime, thousands – of dollars to ride in equipment which would embarrass the sloppiest hotelier. Coach passengers are riding in tin cans with upholstered seats that don’t even measure up to the Spartan standards of some commuter railroads. In his third year of stewardship of Amtrak, President and Chief Executive Officer Alex Kummant’s railroad is generating more buzz in the local and national news media than has been generated for decades. Americans are rediscovering an important part of our domestic transportation network – passenger trains. Congress is moving towards a long-awaited reauthorization of Amtrak, and state governments are plotting and planning expansion of state and regional rail routes. At this moment, about all anyone can do is plan, because Amtrak through the years has squandered its resources, decimated its fleet of rolling stock, and stubbornly stuck to a bad business plan which has resulted in Amtrak remaining technically bankrupt since its founding in 1971. 8) Let’s repeat Andrew Selden’s assessment of Amtrak, as published in this space earlier this month. Amtrak under CEO Alex Kummant is continuing its long slide into irrelevance. Amtrak’s market share (including in the NEC) dropped again. Kummant led the company to an increased annual loss in 2007. On $165 million increase in ticket revenues, and $110 million increase in total revenues, Kummant produced a $53 million increase in the net loss and a whopping $280 million increase in total loss on the year, of $1.l338 billion on total revenue of $2.15 billion. $180 million in increased labor costs from forced labor settlements were a major factor in the results, but expenses surged in every major category except casualty clams. The Annual Report, published months late (by SEC standards), called this "... a good year." The Annual Report, almost devoid of critical and relevant metrics of segment performance such as load factor, return on investment, and output in passenger miles, is a depressing celebration of Amtrak’s squandering of hundreds of millions of dollars of free federal subsidies on its absolutely least productive and most grossly over-served markets. Amtrak’s total revenues were higher in 1998 than in 2007, although "passenger ticket" revenues did reach a new record last year. Its operating ratio, at 1.48, has not improved in ten years. What has improved is federal support. Amtrak’s subsidies during the Bush administration have averaged about $1.2 billion a year, fully 40% more than during the Clinton years. (Discounted for inflation, the growth in subsidy has not been that great in "real" terms). But, judging from the financial results reported for 2007, that money has not been prudently or effectively invested. Management’s entire focus has been on its least productive services, the short distance regional corridors. 9) At this given moment, Amtrak has a passenger car fleet of 1,345 active cars for nationwide use. Daily requirements call for 1,072 cars, so there is a very small cushion for cars to be taken out of service for maintenance, or if some cars are lost due to wrecks. There are another 200 or so identifiable cars beyond the active car roster, a few of which are being rebuilt and refurbished to be put back into service, and others which Amtrak claims it has no money to rehabilitate so they can again generate income and revenue to the company. If Amtrak was serious today about any small or medium expansion of its network, it could only dream and run trains on paper. There are so few passenger cars left that any type of serious route expansion is in jeopardy. 10) The House of Representative this week passed reauthorization legislation for Amtrak which is coupled to a bill requiring the installation and implementation of positive train control systems for all railroads throughout the country (Positive train control is a system which automatically stops a train if it has run a red stop signal or is in the wrong place at the wrong time instead of where the dispatcher has placed the train.). The reauthorization legislation, which has not yet passed the Senate, will authorize (but, not appropriate; that is a separate process) billions of dollars for Amtrak, including the upgrading of some currently derelict passenger cars. What the reauthorization doesn’t do is require Amtrak to be a better run company, nor spend its resources where the most good is accomplished, such as in the national long distance network. The specific uses for the money is mostly up to the Amtrak Board of Directors and Amtrak’s cadre of executives. That’s pretty scary, because most likely most of the money will be spent propping up expensive-to-operate, but low revenue short distance and regional trains. 11) Amtrak’s moment is now; the opportunity is at hand to take advantage is a growing interest in a full renewal of passenger rail travel coast to coast. The looming question is whether or not Amtrak’s management understands the gravity and opportunity of the moment, and will do something which will benefit both Amtrak and our nation. You MUST include your name, preferred e-mail address, and city and state where you live. If you have filters or firewalls placed on your Internet connection, set your e-mail to receive incoming mail from twa@unitedrail.org; we are unable to go through any individual approvals processes for individuals. This mailing list is kept strictly confidential and is not shared or used for any purposes other than the distribution of This Week at Amtrak or related URPA materials. Construction on the Bangerter Bridge is anticipated to begin in mid-October. More details will follow in upcoming construction updates. Activity: Utility work at the intersection of 3200 West and the railway. Traffic Impacts: 3200 West will be closed at the trackway between approximately 8600 South and Haun Drive September 22nd through September 29th. Please use 8600 South or Haun Drive as detour routes. Detour signs will be posted. Activity: Construction of sound wall along right-of-way rail corridor between 2700 West and 3200 West began on September 2nd and will continue through the end of the month. Activity: Construction on the Jordan River TRAX bridge. Traffic Impacts: The Jordan River Parkway Trail will start a temporary detour near approximately 7500 South beginning September 25th. The trail will be intermittently detoured through August 2009. Please be aware that the detour does cross a live railway track, and as such, the detour will be closed daily from 7:00 p.m. to 7:00 a.m. when freight is actively running on the track. Please plan accordingly. Activity: Construction activities on 1300 West at the railway have been postponed. Traffic Impacts: 1300 West will be not be closed at the railway from September 15th through September 22nd. There will be a notification when this work begins. If you have any question or concerns regarding the project, please let me know. You have been included on the Mid-Jordan Light Rail TRAX Construction Update project update email list. Each time the construction schedule is updated, you will receive an email notifying you of the update. If you would like to be removed from this list, simply send an email stating so. Becker trying to slow U of U project?